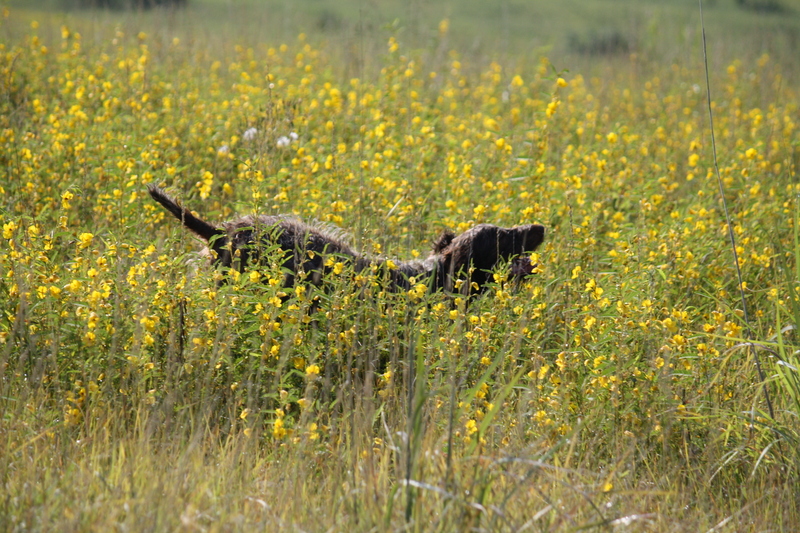 Today we ran Bluestem’s Prairie Fire “Fire” in her first formal dog event. 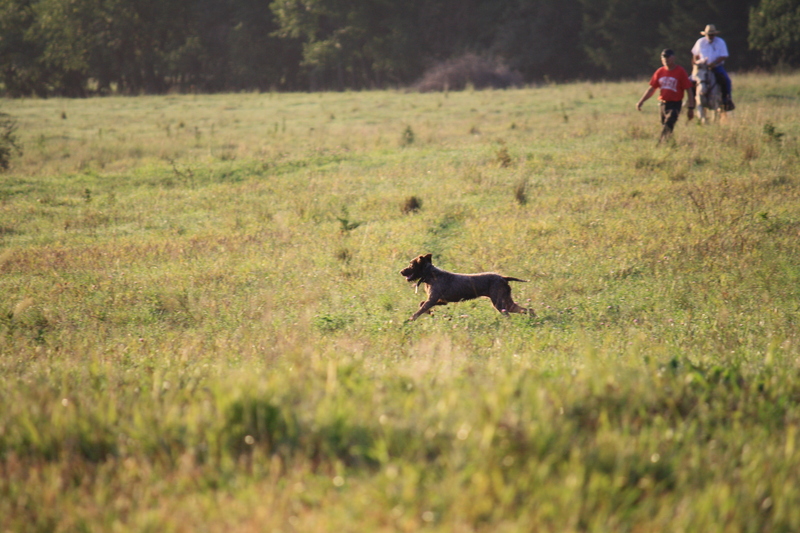 She participated in the German Shorthaired Pointer Club of Nebraska’s Fall Field Trial in the Amateur Walking Puppy and Amateur Walking Derby stakes at the Branched Oak Field Trial Grounds near Raymond, Nebraska. 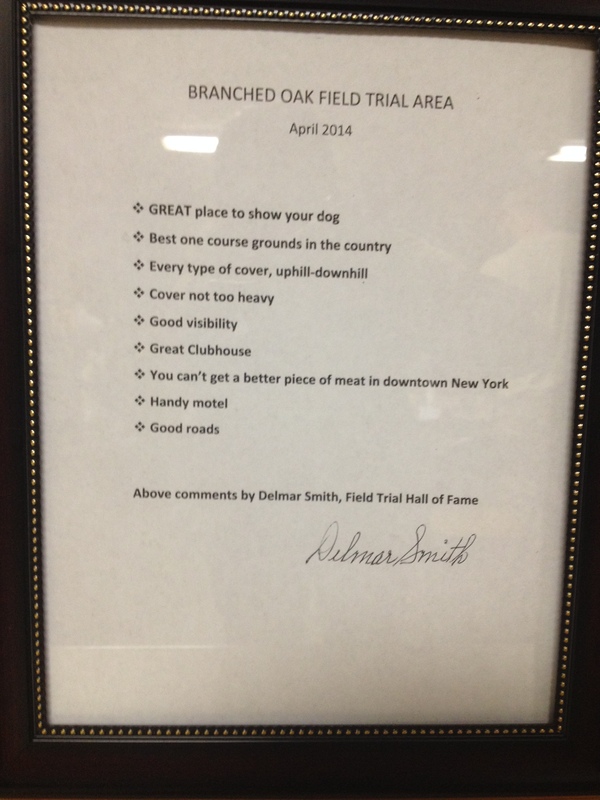 These grounds are famous and I noticed a new sign hanging in the lodge as I was getting breakfast this morning. It is notes made this spring by Delmar Smith. We met Delmar in Kansas City at Pheasant Fest a few years back and he is definitely a sage of the sport. 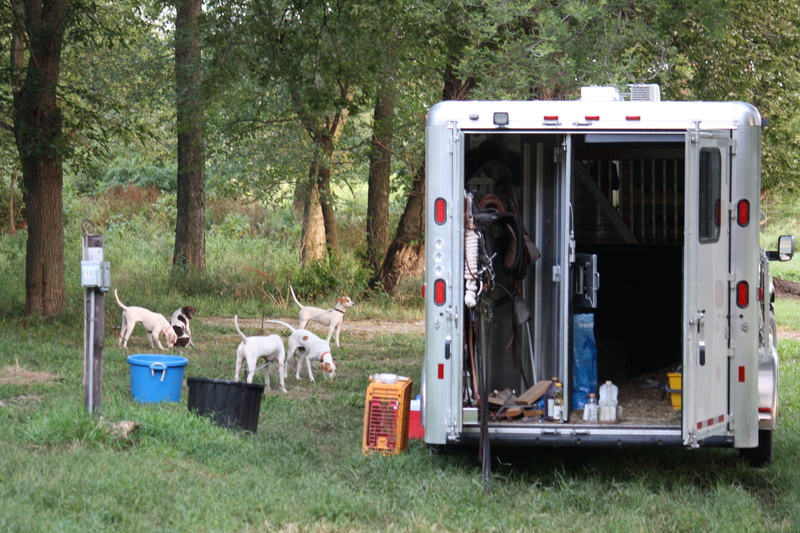 It was entirely English Pointers and German Shorthaired Pointers, but we had fun and Fire had a great experience. Of course she was shown up with range in the field because of her young age (6 1/2 months) and the close-working nature of the breed, but due to the fact that there were only 4 dogs entered in the Amateur Walking Derby, we did walk away with a ribbon. Although it was a “gimme” (which none of BB’s field trial placements were), it was still cool to represent griffons and be the only 6 month old griff ever to have placed in an AKC Field Trial. 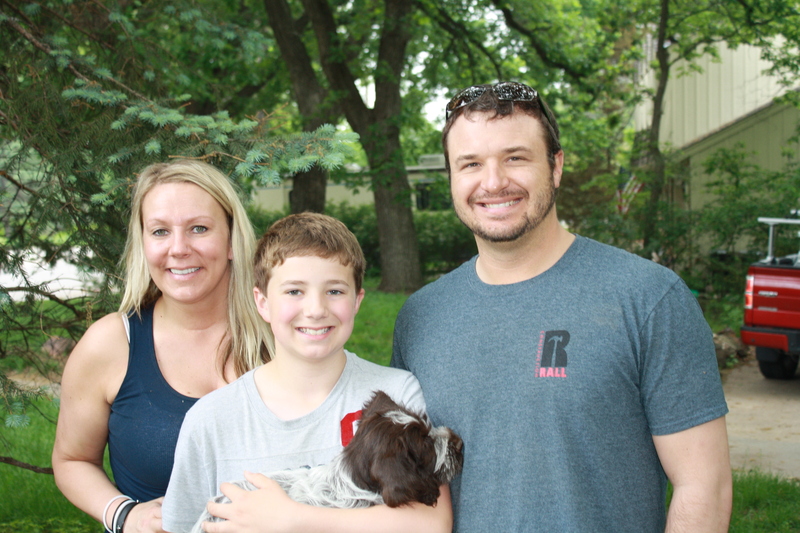 We also had visitors from Matt and Carter, who live around Lincoln and will be getting a Sam/BB pup next year. Matt and Carter saying hi to Fire. 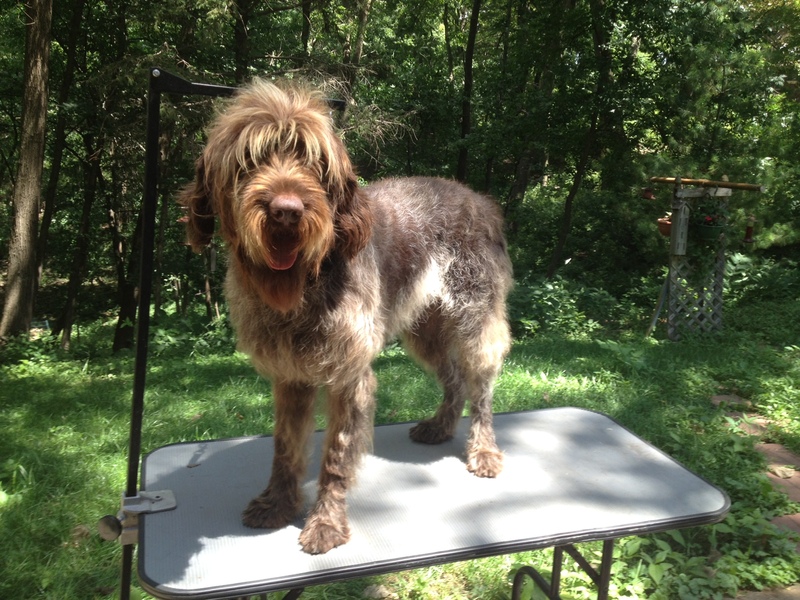 I really hate to cut this short, as there’s more to say, but I am still not packed for the AWPGA National Specialty Dog Show, Hunt Tests and Annual Meeting this week in Maine, and I have a 6 AM flight to catch in the morning. I’m taking all of my equipment with me, so maybe there will be a blog post part 2 if I get the time this week, but I will probably be busy seeing all of my long lost dog friends. If I don’t get to it, I’ll catch up with y’all next weekend. 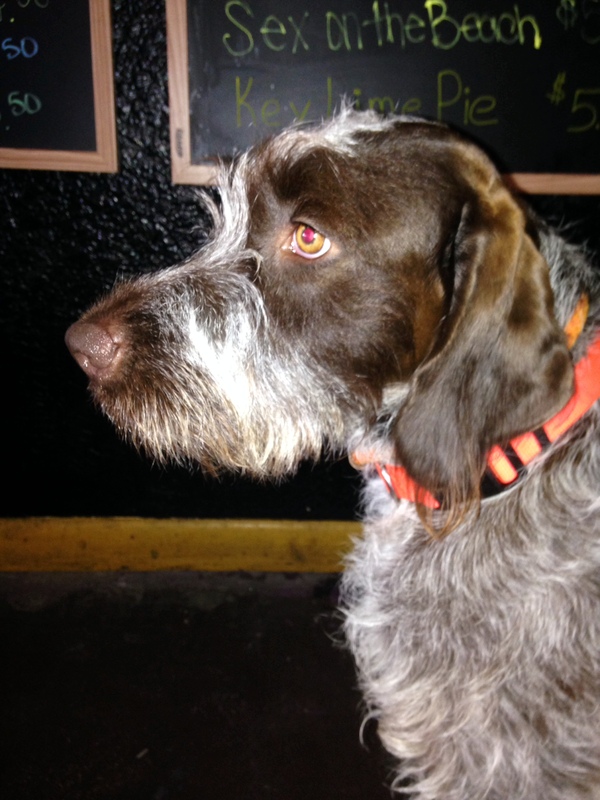 I received an e-mail from Charbel in Mexico City that six month-old Bluestem Freyja, sister to our pup Fire out of Sam and BB, is now officially the only registered Wirehaired Pointing Griffon in Mexico! Viva Griffon! I find the name that they use quite interesting, as it literally translates into “Pointer Griffon of Hard Hair”. 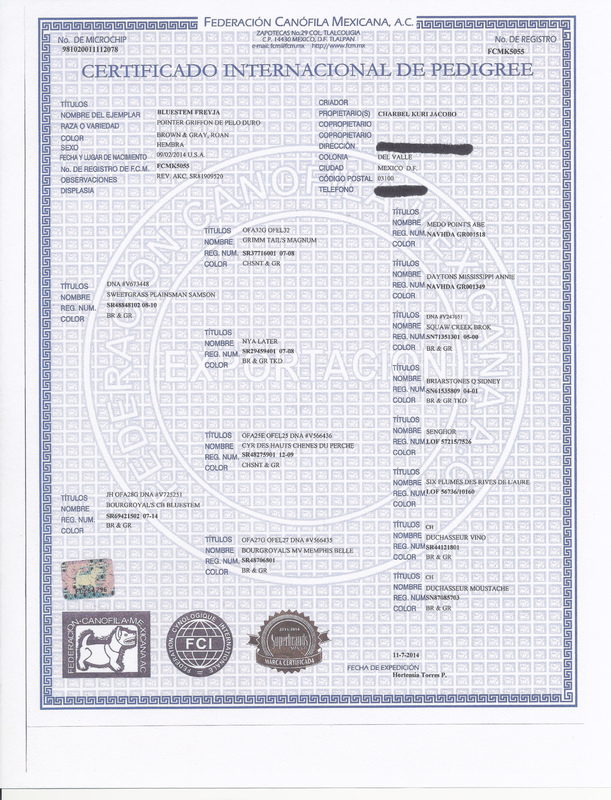 Here is the official pedigree from FCM, and thank you so much to Charbel for sending me a copy! It is pretty cool that in 3 generations it goes from France (Cyr, the sire of BB), Canada (BB was born), US (where Freyja was born), and now to Mexico. 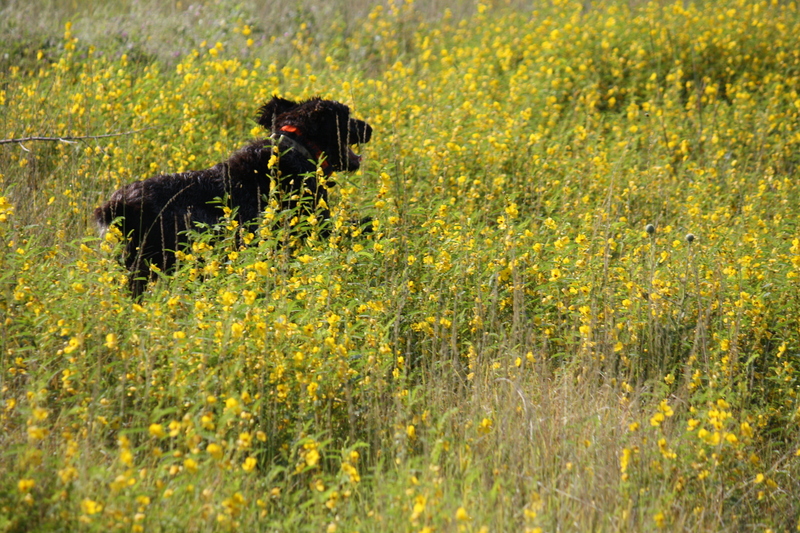 I know that she has a good life down there, and I can’t wait to get some pics of her chasing some of their crazy quail. Our poor raggedy chukar have been sitting in the holding pen for too long. It isn’t a flight pen and most of them are big males and have pecked one another over quite a bit. But we decided that Fire absolutely had to get out. So yesterday morning, off we went to the dog training wildlife management area south of town with three chukars. It has been raining so much that the grass was wet, and the birds were wet. But Charles planted them anyway. At that point, we hadn’t had Fire out working birds or even for a multi-hour walk for about a month. The first thing that she did was take off like a bat out of hell right down the scent of Charles’s boots, with no care in the world for the whistle. 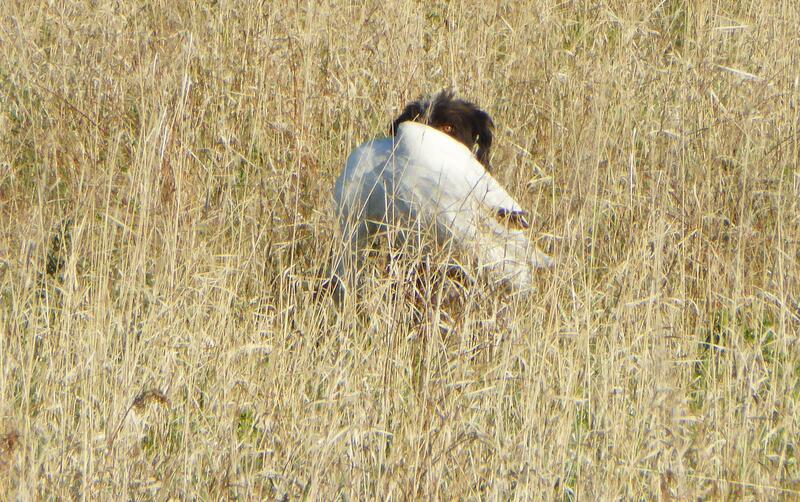 We finally found her about 150 yards away, up and over the hill with the last bird that he had planted in her mouth. On the second bird, we got a point out of her that Charles was able to walk in on, but it barely flew and was almost an Arky shot (looks like I need to add Arky Shot to Urban Dictionary. It is when a person shoots a bird on the ground or in a tree, which is extremely unsportsmanlike when not totally illegal). 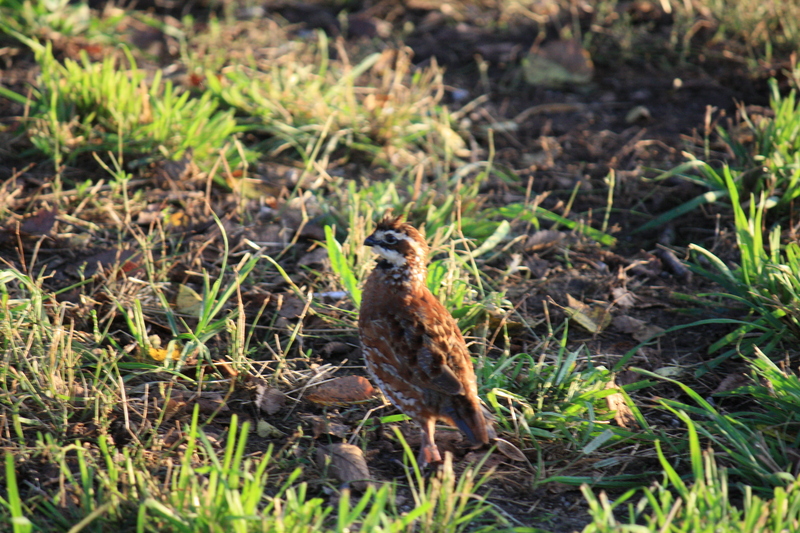 But he wanted to make sure that he fired the shotgun and the bird was dead when she got ahold of it. I think that the shotgun blast scared me more than it did the dog, so it looks like we’ve got the pup’s shotgun conditioning finalized. She retrieved that bird, but I was still too stunned from the blast to get a photo of it. We got a decent point on the last bird, but it didn’t fly but about 6 inches off of the ground, right into Fire’s mouth. Aw hell. 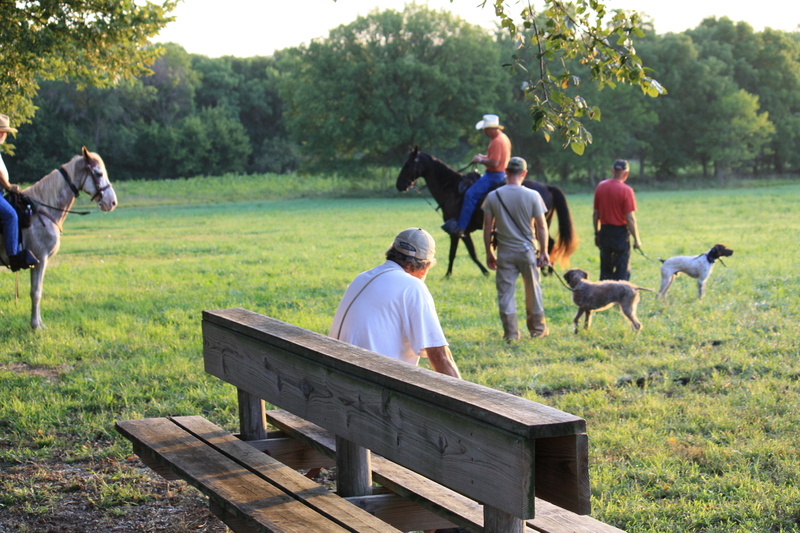 Although it makes for a funny story, and everyone who trains dogs has these days, it was still a big thumbs down. Yet I digress. This morning, we finally got everyone out for a run. And it was fun. Sam, Fire, BB, and Charles. 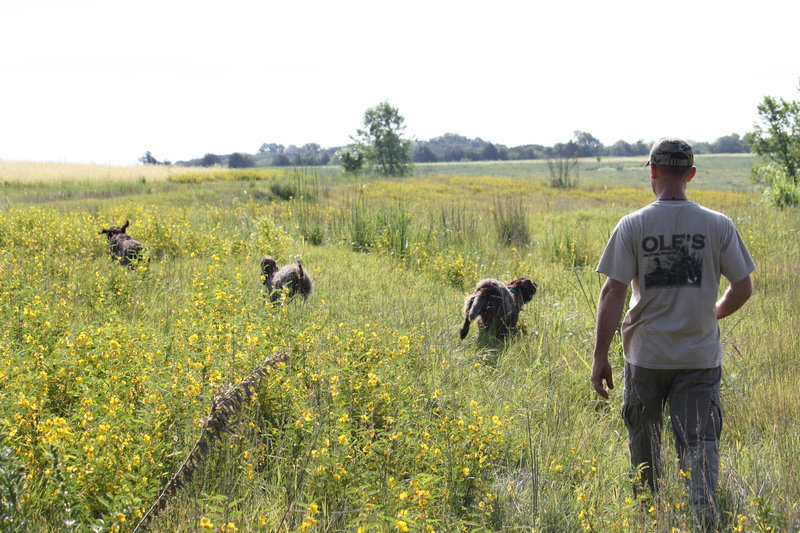 This weekend, we will be running Fire in the Amateur Walking Derby and the Walking Puppy Stakes at the German Shorthaired Pointer Club of Nebraska’s Fall Trial at Branched Oak Lake Trial Grounds. I’ll be sure to get something up about that at the end of next weekend before I get on the plane for Maine. I’m hoping that the stakes prior to the Derby are large, because if it falls on Friday, I will have to handle. It would be my first time. I thought we’d be running again the following weekend, but once I went to fill out the premium for the Lincoln club, I realized that there are no walking stakes. 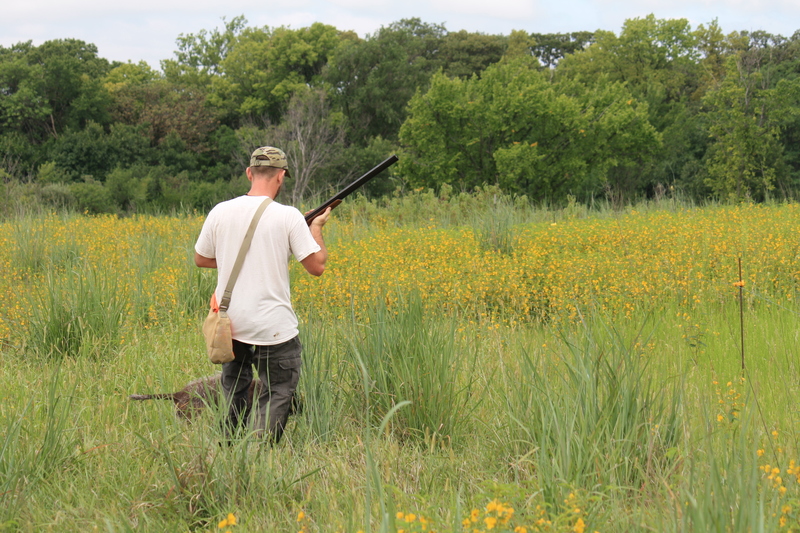 So we’ll have the first weekend of September off from dog activities and just plan on sitting for some doves on Monday the 1st. Founded in 1961 to save the greater prairie-chicken (GPC) in Wisconsin, the Society of Tympanuchus Cupido Pinnatus, Ltd. (STCP) is working today to better understand the dynamics that maintain the nation’s largest viable population of GPC in the Nebraska Sandhills – the last best place to study the species in their natural grassland environment. 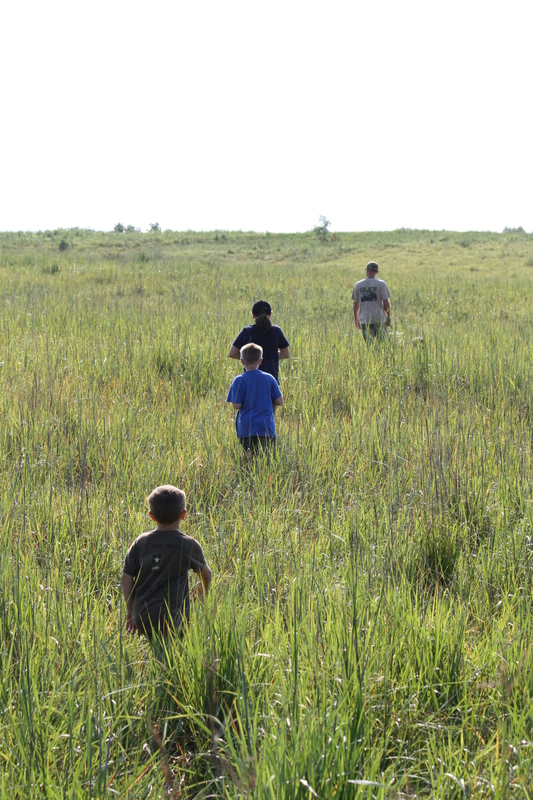 The goal in the Sandhills is to document productivity, habitat use, and movements of GPC and provide an understanding of how this is interwoven with human activities in the region. If GPC are to prosper as a species we need to better understand their needs and work to determine a scenario where compatible land uses will provide a secure future for them as well as humans so that both may coexist. Our proactive approach at studying the dynamics of this large population now means that we can likely prevent the GPC from following in the wake of the lesser prairie-chicken – which is now listed as threatened, and the greater sage grouse, which may also be listed next year. If similar proactive research had been undertaken 20 years ago with these species, they might not be facing the uncertain futures they face today. 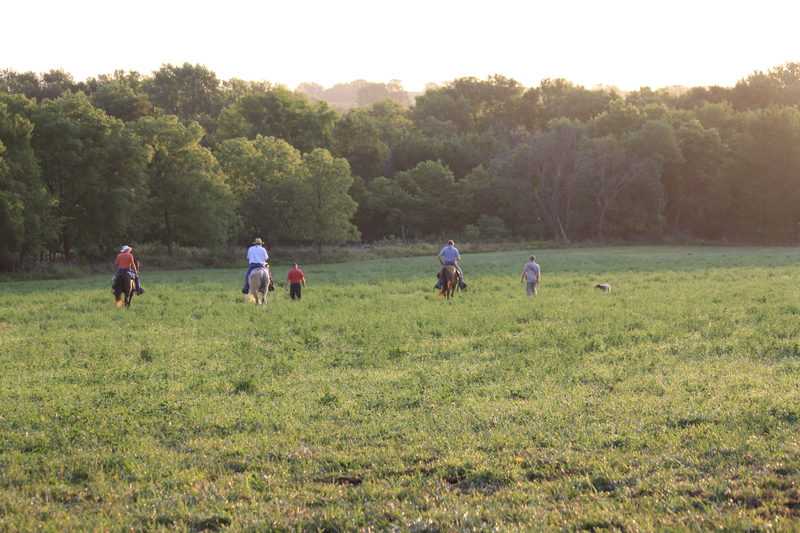 Gaining a thorough understanding of the life history of Nebraska’s large GPC population will also help provide a future for the isolated, remnant GPC populations in Wisconsin, Illinois, Missouri and Iowa. For it is from the large populations that these states will need to translocate birds from to restore genetic health and increase numbers to maintain their “museum” or “zoo” populations as they are often referred to. Without a stable source population where birds can be drawn from for periodic translocations, these small, isolated populations will eventually fade away one by one. For a more comprehensive history of STCP and an account of our research efforts including work with the endangered Attwater’s prairie-chicken, please visit our website at: www.prairiegrouse.org. I need to go and get the kids ready for school tomorrow. It is very much unlike me to do a Sunday night post, but I desperately need to save my writing time in the morning for my paid writing gig. Oh, I also wanted to give a special shout out to the late night internet lurkers on my blog. I am also one of those people who gets up almost every night for 15 minutes or so between midnight and 4 AM and gets online. I know it is neurotic and a bad habit, but I always check my stats and see there are folks out there reading my blog at that time. I also see that there are people reading my archived posts from several years back. How embarrassing, it is a real cesspool in places. But that is just part of keeping an online diary. I’m glad that you enjoy it. We will be using Ben as the sire on the litter planned with Velma (De Jac’s Zip-Ah-Dee-Doo-Dah) for 2015. Ben is from our 2011 “B” Litter between Sam and Sue. We had him here as an overnight guest last week in order to get his hips X-rayed, which is really just a formality as there is no sign of anything wrong. It is just one of those things that you are supposed to do before breeding a dog. Ben has a wonderful temperament: he only barked once or twice out in the kennel even though it wasn’t home and he let me mess with him up on the grooming table without putting up a fight. 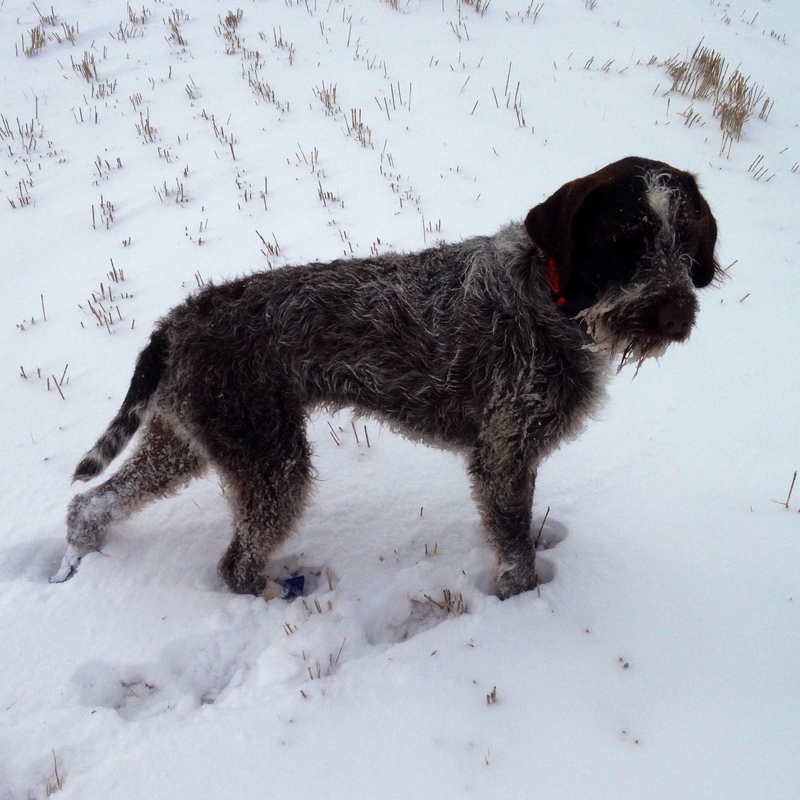 He is strictly a wild bird hunter of quail, sharptailed grouse, and pheasant here in Nebraska. 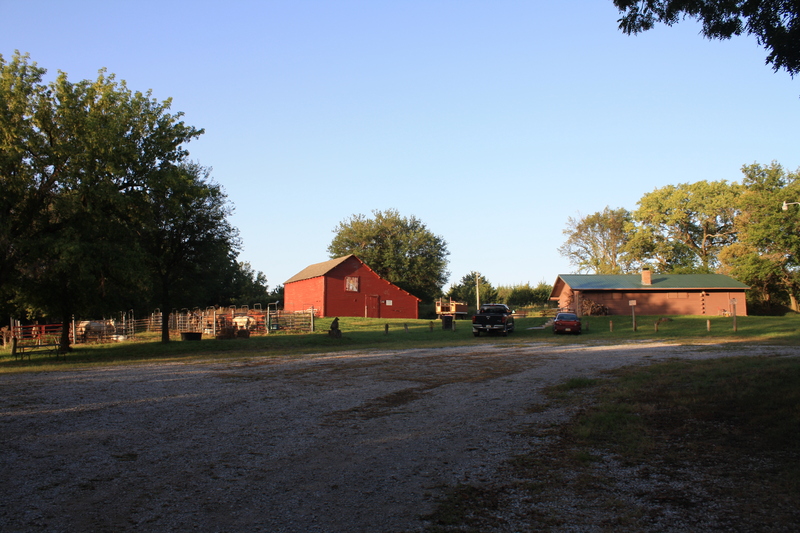 He lives on a farm outside of Lincoln with Nate and his family. We plan on taking our next stud puppy out of the Velma and Ben litter, they really compliment each other well in their conformation. 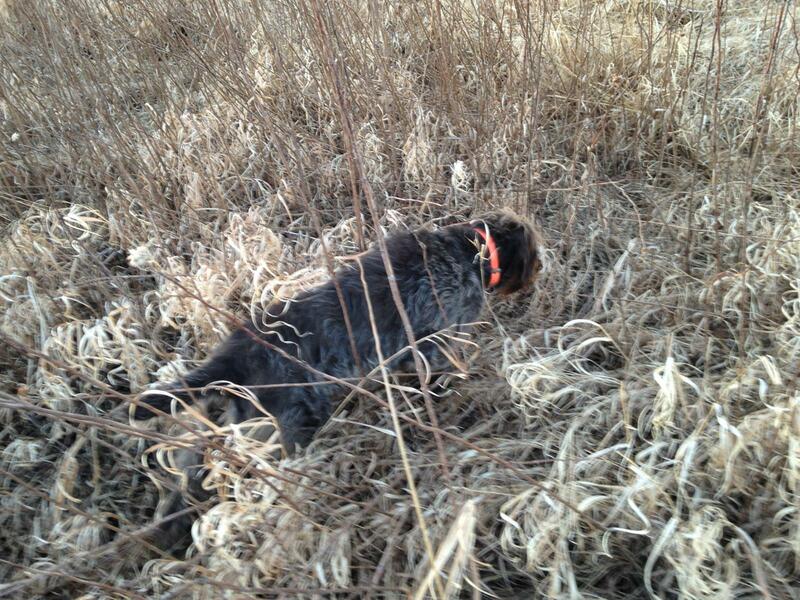 Ben on point last fall on a hen pheasant. I was really blown away by Ben’s head furnishings, neither of his parents have anything near that long. I would put his eyebrows and beard at around 4 in. long. His face really makes me think of the West Coast show griffs. His body coat is more of the hunter lines liver coat, but it isn’t flat like some, it does have a curl to it like Sam’s. Then the chest and the legs have lots of gray fringe on them. He also isn’t too big, 64 lbs. and probably 23 in. at the shoulder, so really the perfect size and right in breed standard. We hope to get out this fall and do some hunting with him too, so I’ll have more pictures of him then. 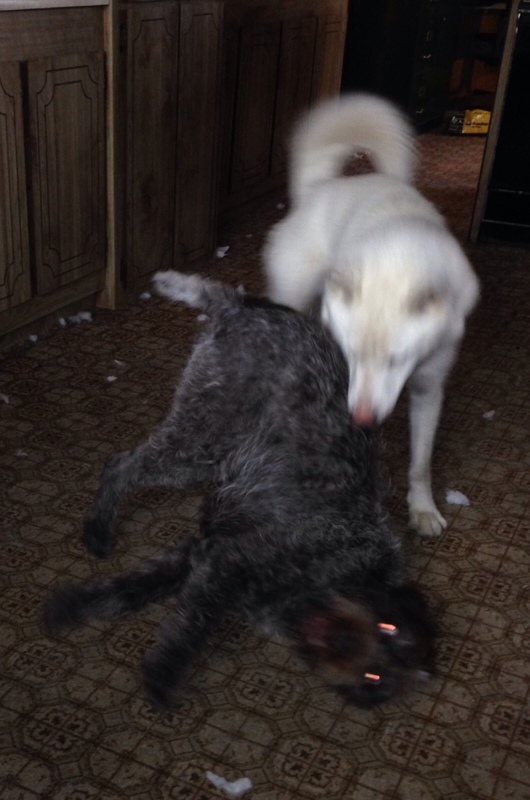 Mae is doing really well with my brother Ron, and his Siberian Husky Whisper. Whisper used to escape and run away all of the time, but that has changed now that he has an old lady. Mae was fixed before I moved her, so there will be no griff/husky cross puppies (although it was much talked about in jest beforehand). They sit around the yard all day, then play fight in the house at night. Mae and Whisper doing what they do best. 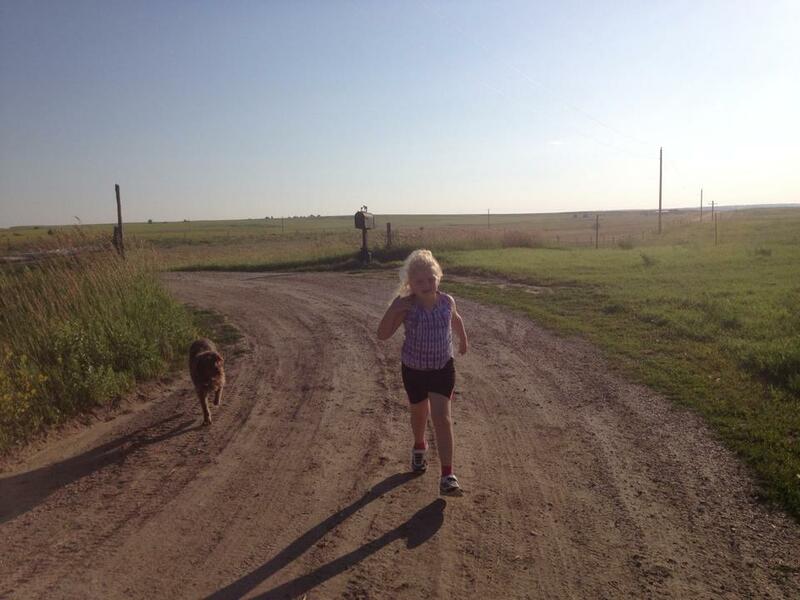 Stan shared a cute picture of old Sue running with Savannah down the driveway, she seems to be very happy playing with the kids. Trey is 12 this year and passed his hunter’s safety, so game birds in Mellette County, South Dakota be warned. Sue and Savannah on a jog. 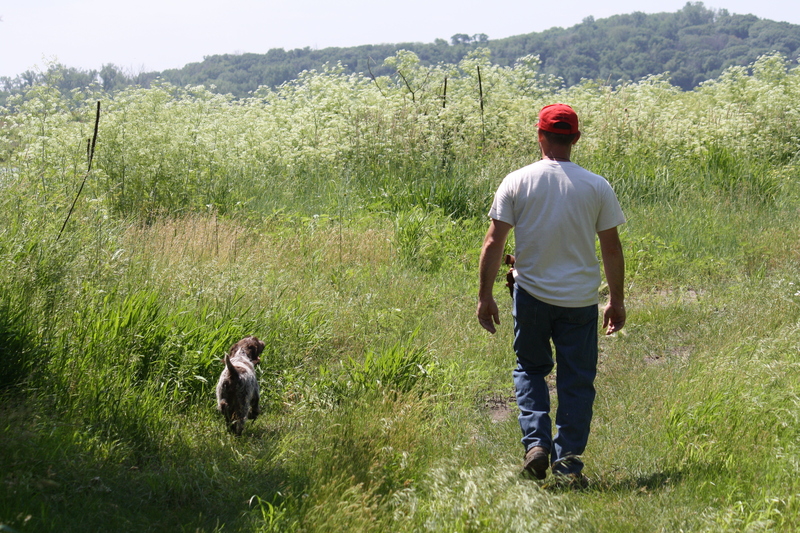 Last weekend, Charles took our 5-month old puppy, Fire, out to Skyline Sportsmen’s Club in Thurman, Iowa for training with the Heartland NAVHDA Chapter. 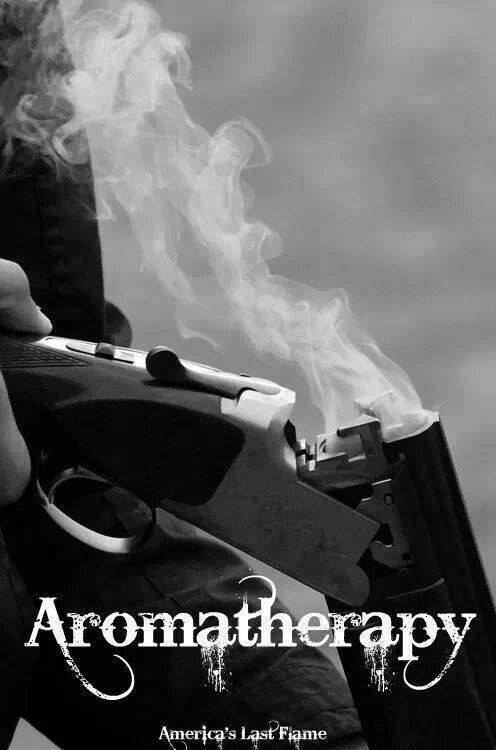 She did her first exercise with live shotgun fire and did just fine. 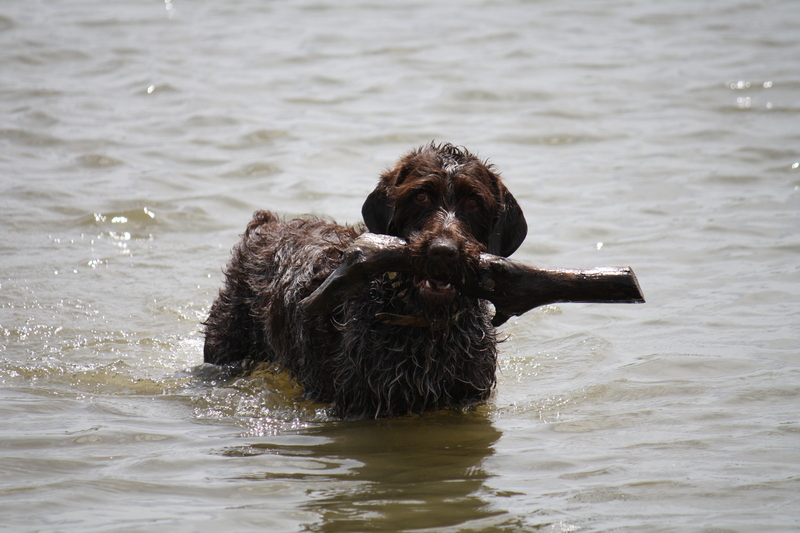 She also retrieved bumpers from the water. The veterans of the chapter said that she is ready for her Natural Ability test, so we will go ahead and move that up to October of this year. We were talking about doing it in the spring, but will go ahead and move it up and do the UPT test in Spring of 2015. That way we can get her through the Utility Test prior to her coming into breeding age, probably Fall of 2015. Belle has been just almost the perfect pet. She is so personable and most always very obedient. I will take partial credit on the obedient attribute. We had her spayed prior to her coming into heat the second time, so about 16 months ago. After going through one cycle of wearing doggie diapers and having to be careful what dogs we hunted around that first fall, I didn’t want to go through that again! She is an inside-outside pet. Inside when we are home, but outside if we are going to be gone more than a couple hours. We got our yard fenced shortly after bringing her home, so she has about half an acre to be in. I continue to be amazed on how smart she is. She can open doors (we have door handles instead of door knobs), know toy names, and last week she fetched my socks and shoes to put on so we could go on a walk! When we go to our public walking area, I usually don’t have her on a leash unless we are about to walk past another dog or geese. She always wants to get in my truck to go someplace. 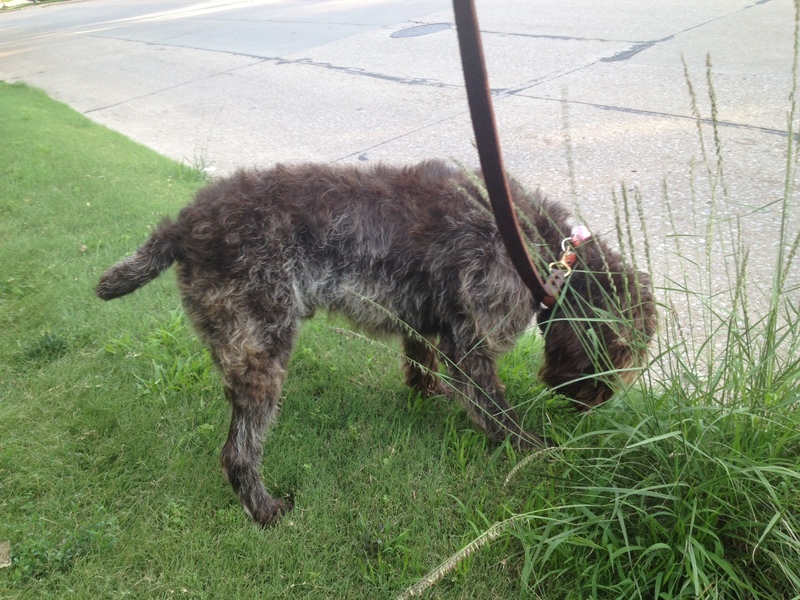 There is a pub in Stillwater that allows pets on leash. Attached is a picture of her in front of a menu board. 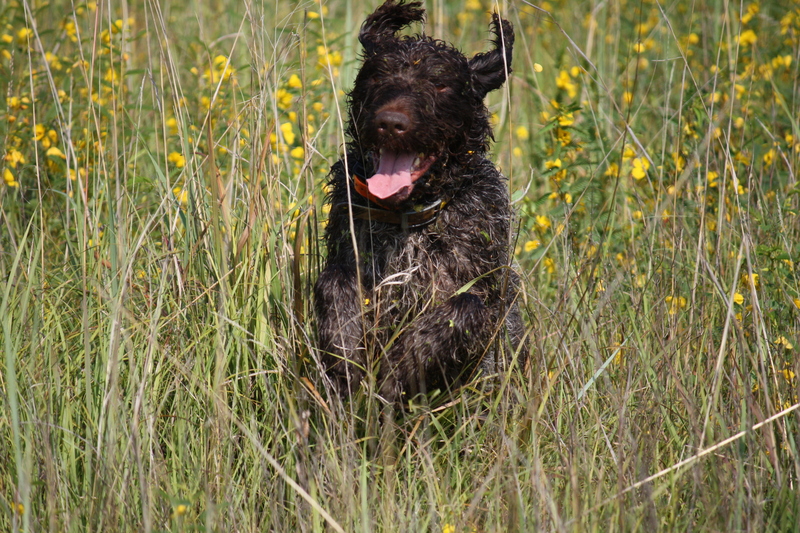 She does great hunting, super nose and follows commands: verbal, whistle & hand directions. One of our most fun days out last season was the Jan 31st in north-central Kansas. We woke up to new and continuing snow. 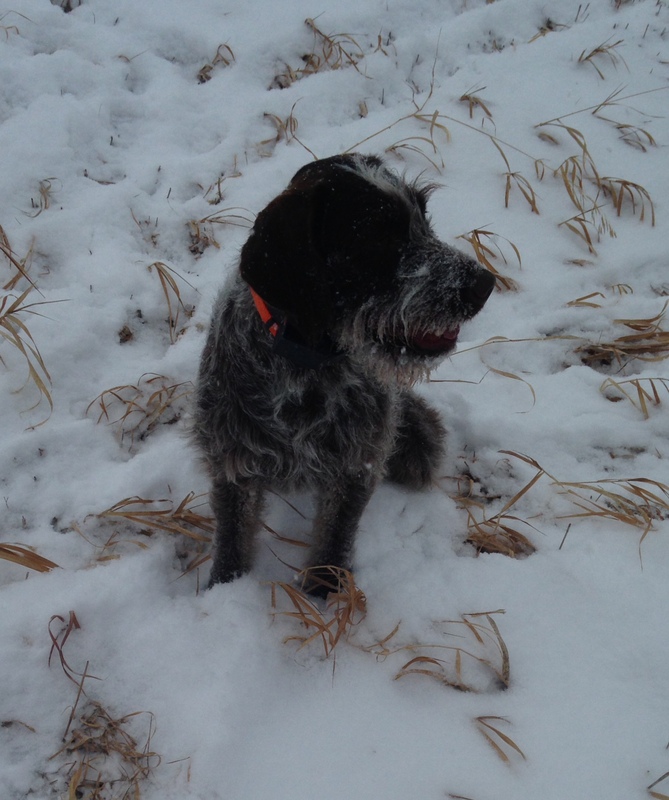 Belle loved hunting in that cold and snow. Attached are a couple pictures of her that day. She was caked in snow and had a vast number of icicles in her beard. I look forward to seeing more of your posts. Thanks so much to Cliff for that update, I am pleased with how all of these pups have turned out and it really bolsters my spirit to hear from my owners. Infinite gratitude. It is hard to believe that I’m fast approaching 300,000 lifetime hits on a totally homemade blog about an obscure breed of hunting dogs written by a gal who considers herself half redneck and half intellectual. I suppose I could sell ads on my YouTube videos and convert this over to a site where I could put ads on it, but it is a passionate hobby and am fearful of taking myself too seriously. But when I am able to see folks from all over the world reading it, like daily hits from Brazil during the World Cup (probably some Dutch and German griffon enthusiasts), it makes me feel pretty self-conscious and aware that I’m representing my breed and my sport internationally. I need to do a better job of being a professional about it and not so flippant. I appreciate you, my readers, for making me feel appreciated and tolerating my sometimes lazy and goofy posts. I have also finally committed to going to Maine at the end of August for AWPGA National Specialty and the Korthals Cup. I am looking forward to seeing some good friends and meeting some of the East Coast US and Quebec griffonniers that I’ve only encountered online. If you’d like to join us, registration is open until August 1st http://www.awpganationalspecialty.com/. Enjoy the end of summer and stay cool. Griffs love kiddie pools, so bust one out if you haven’t already. 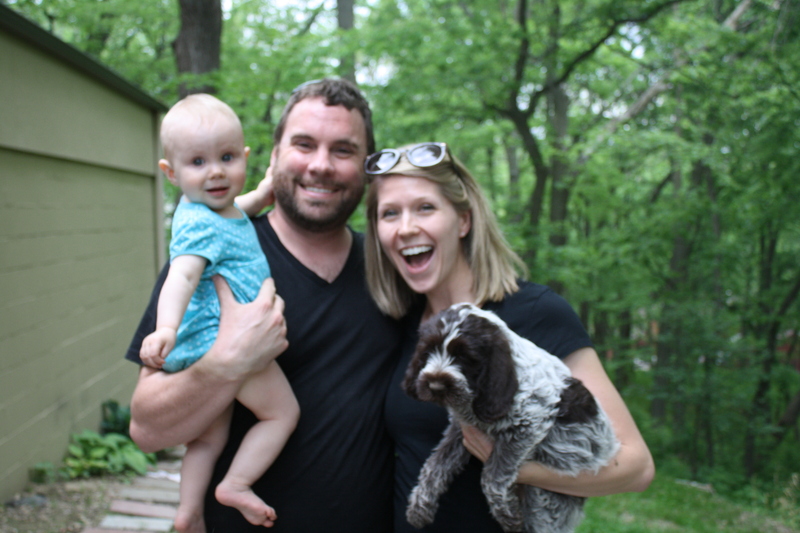 One last thing: I finally updated the gallery on the About Us/Contact page to include the last two years of our adventures, so be sure to check that out. The button is in the brown top navigation bar. 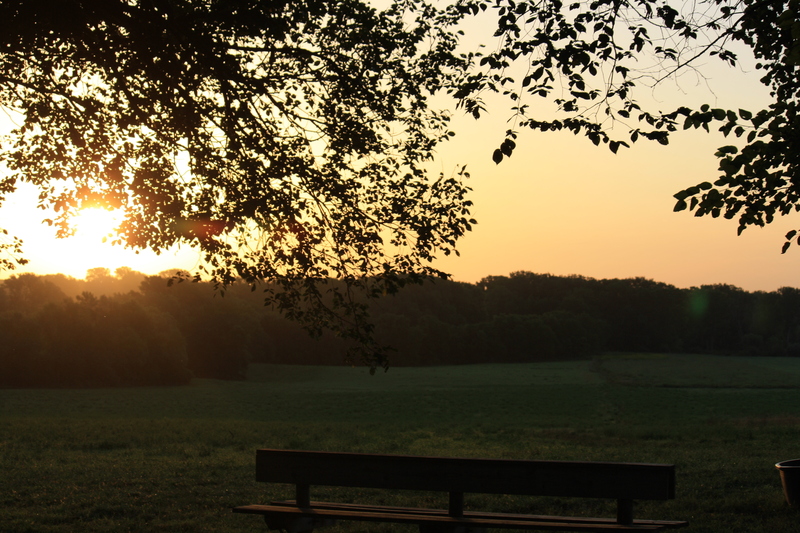 It was only in the 50s when the sun was coming up this morning and it set Sam a-howling, which seemed appropriate to me because my first thought when I woke up was, “only two months left and it will be hunting season again”. Although I’m very excited, I’m also a bit nervous since we’ve retired all of our older females at this point and I’ll be hunting with Sam. It will be my first time hunting by myself with a male dog, and Sam and I have our moments where he thinks there is room for debate as to who is the dominate player in our relationship. But I’m sure we’ll get it sorted out and have a grand time as we always do. Opening weekend 2011: Charity, Ryan Tompkins, Charles, then Sue, Sam, and BB. I am just beside myself at the success of Bluestem Big Sky Rendezvous NA I “Midge” in both the field and the show ring. 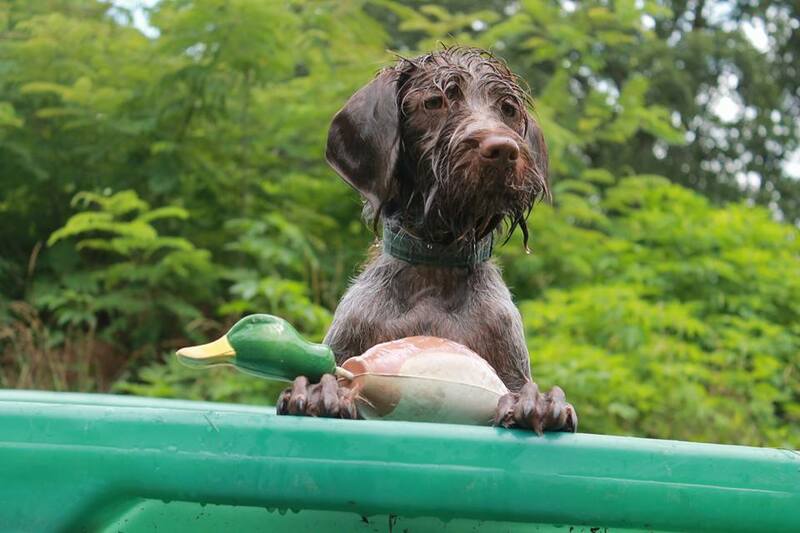 She is from our 2013 “F” litter from Sam and Mae. Only a couple of weeks after her Prize I NAVHDA Natural Ability test with a score of 112, she took Best of Breed on June 20th at the Electric City Kennel Club Dog Show in Great Falls, Montana. The competition in Montana is tough and I am just thrilled. 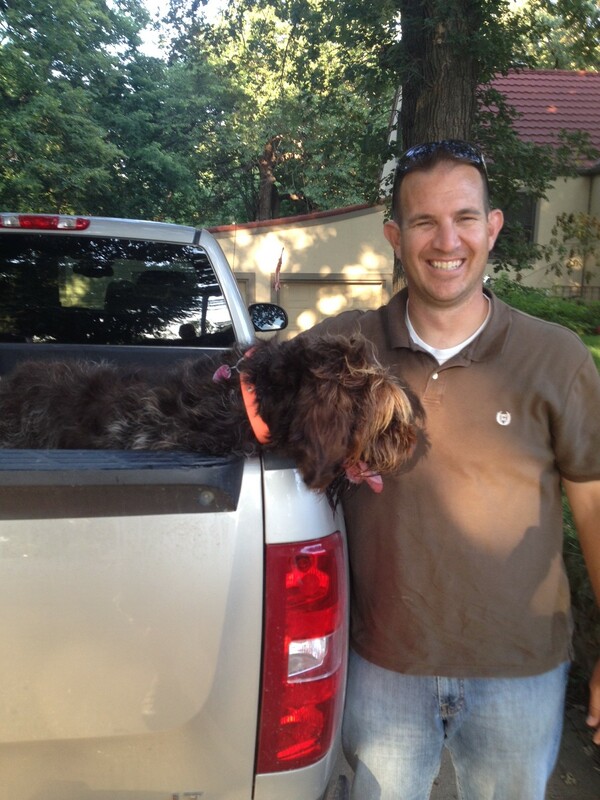 Infinite thanks to owners/handlers Lou and Lindsay Volpe. 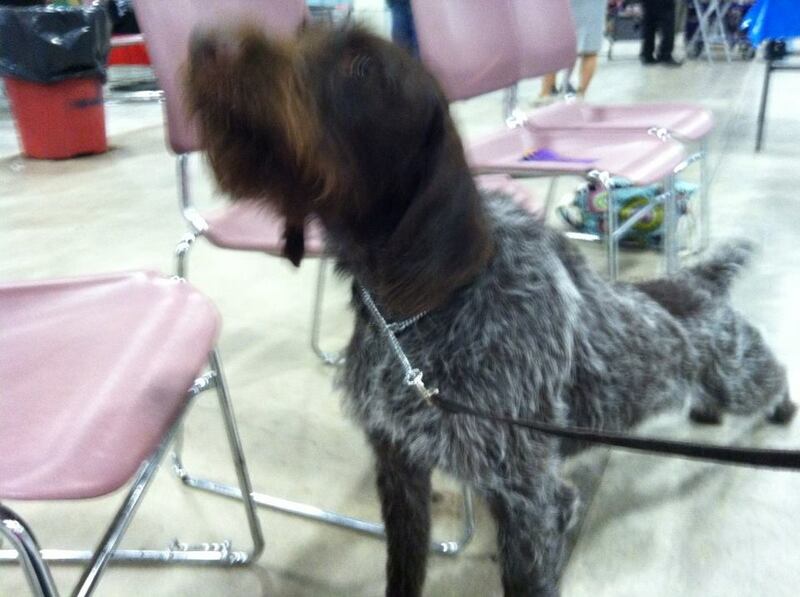 The first and most important thing I have to say about NAVHDA Handler’s Clinics is: GO. I wish that we had gone 10 years ago, as it would have saved us numerous hours of time in both research and training. We were lucky to have 3 judges with us over the weekend: our own Tracey Nelson and Chuck Casanova, and our instructor, Jason Wade from the Sebasticook and Yankee Chapters in Maine. The first day was devoted to going over the Aims, Programs and Test booklet that covers the elements of the Natural Ability, Utility Preparatory, Utility, and Invitational Tests. 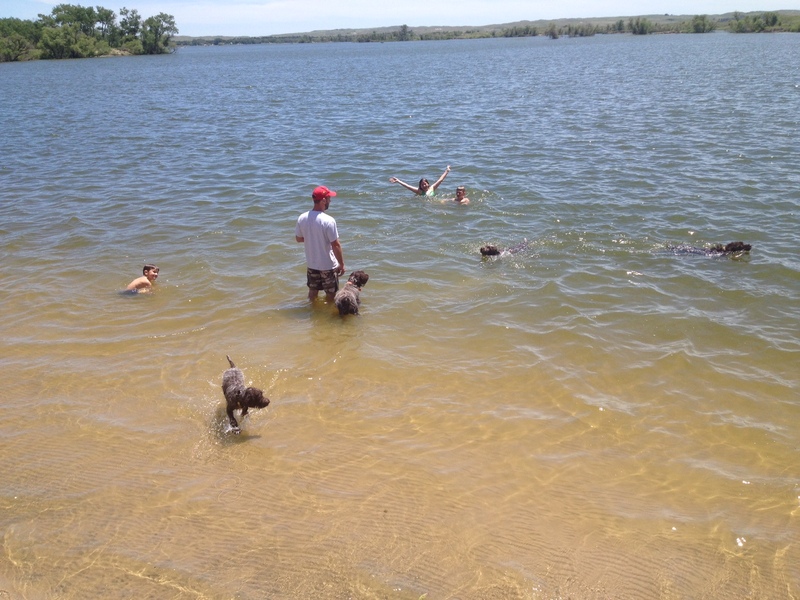 We then scored two dogs at the Natural Ability level. 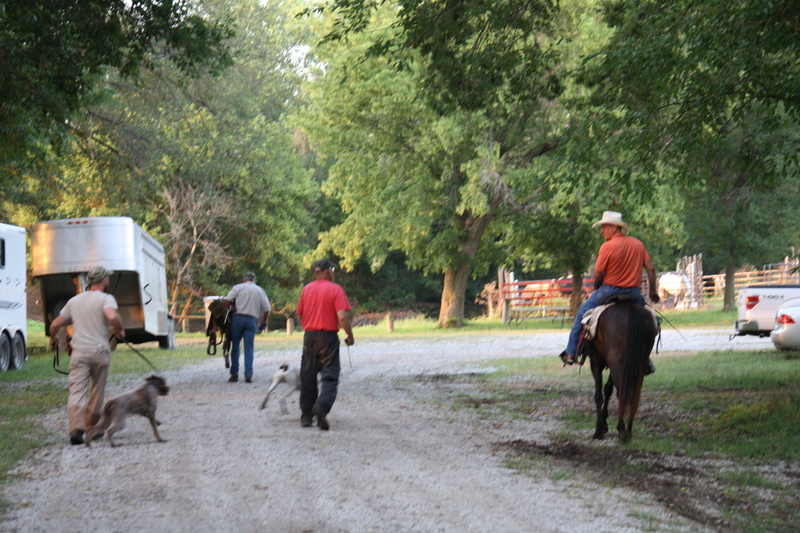 The second day we scored a UPT and a UT dog, then finalized any remaining questions. It was a great combination of direct instruction, guided practice, then finished with independent practice. Kudos to Tracey and her family at Skyline Sportsmen’s Club in Thurman, Iowa for being gracious hosts to the Heartland Chapter yet again. Speaking of the NAVHDA Chapters in Maine, Tyson out in Bangor sent me a pic of Moose doing some work at a recent training day. Moose is from our 2014 “H” litter from Sam and Mae and is 12 weeks old in the picture. 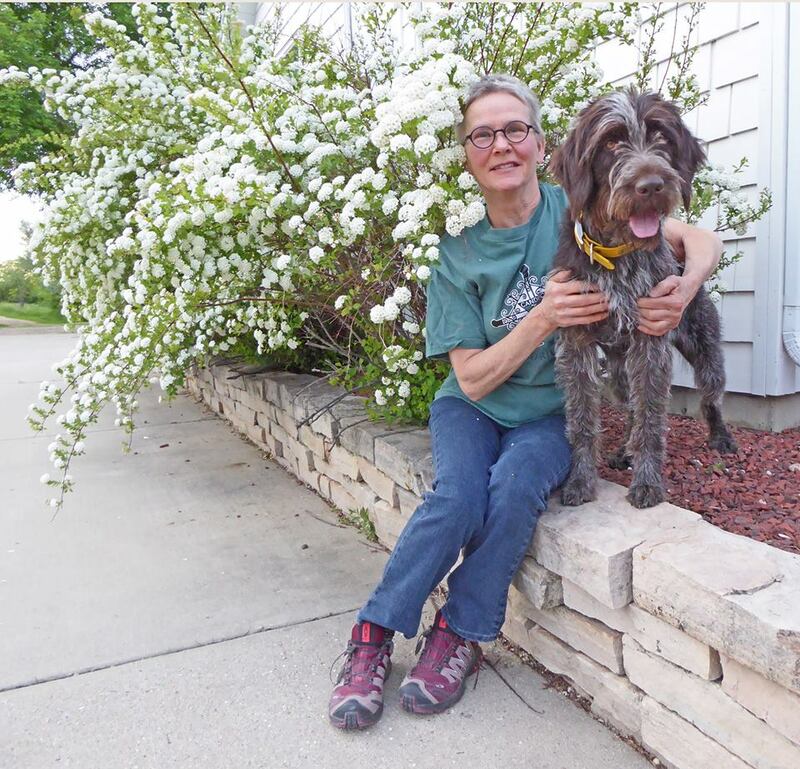 I just love all of the pics that Susan and Tom up in North Dakota get of TracHer and the pretty flowers. 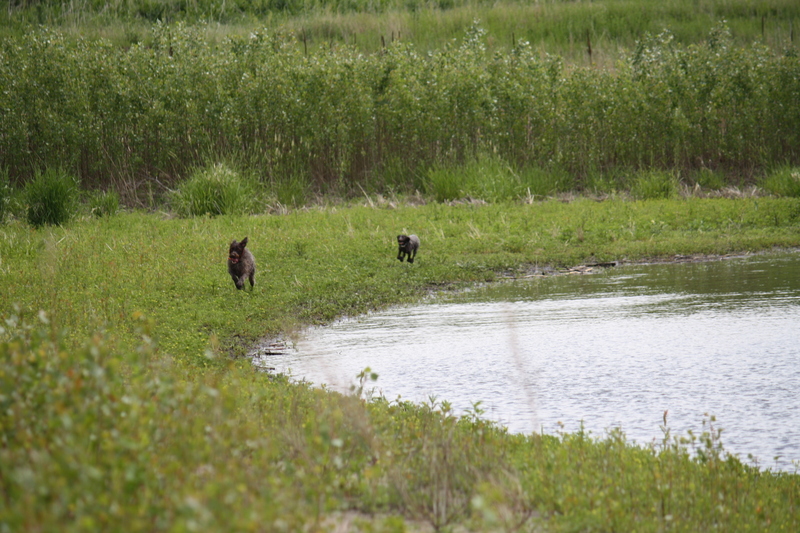 Here is Susan and TracHer, who is from our 2011 “C” litter from Sam and Mae. 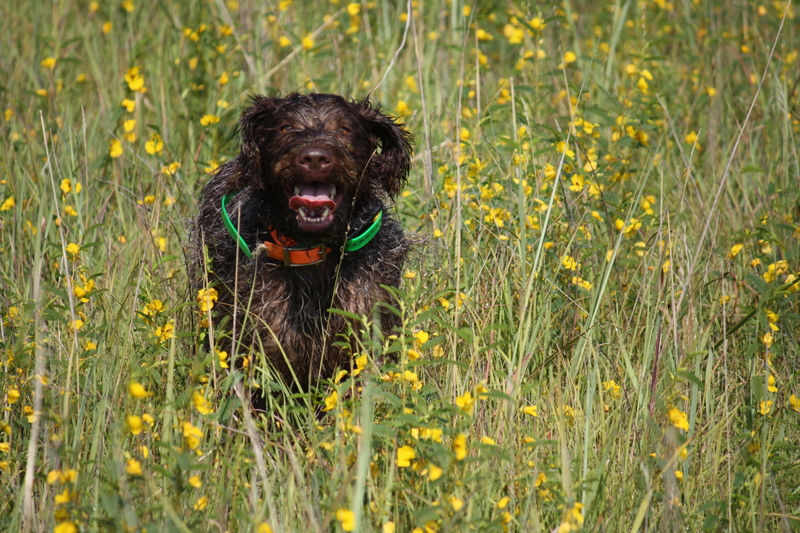 Don’t be fooled by her show dog looks, she’s tearing up the sloughs, ponds, and prairies up there. 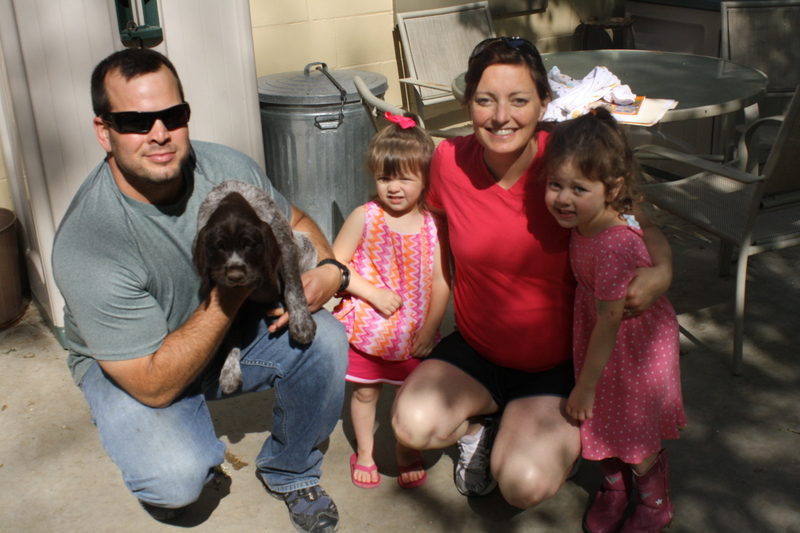 As always, many thanks to all of my owners for sharing photos with me and giving great homes to our pups. We spent the solstice/wedding anniversary weekend up in the Nebraska Sandhills, enjoying time in the outdoors with family and friends. Mae has been officially retired to Valentine, Nebraska to live with my brother, Ron, and his 1 1/2 year old Siberian Husky, Whisper. The initial introduction of the two dogs was a bit dicey, but they settled in with each other quickly and are good friends. As I was writing this, I received a panicked phone call from a griff owner asking about how to deal with burr mats in the coat. 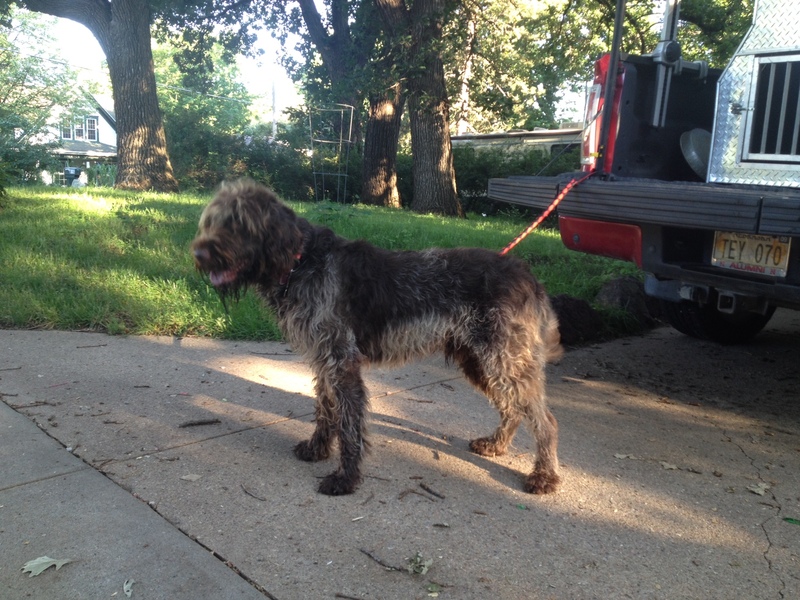 If we run the dogs in burrs, I try to brush them the same or the next day to prevent matting. Should I forget to do this and a mat develops, I try to brush it out with a wide toothed comb or burr puller. I make sure to grab the fur close to the skin before I start yanking on it with the comb. 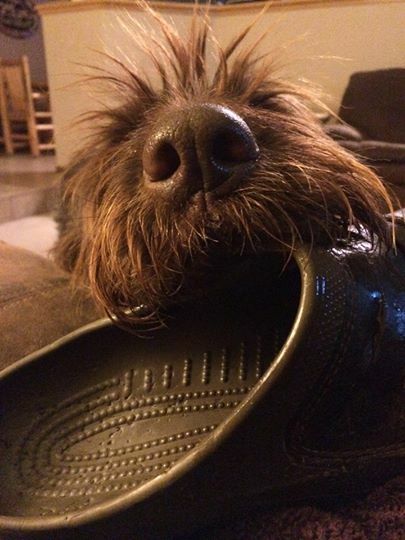 There are spray-on liquid detanglers that you can buy at the pet store to help with this. If it will not come out and the dog is crying and/or trying to grab your hand with its mouth, it is okay to cut the mat out with scissors if you have to. 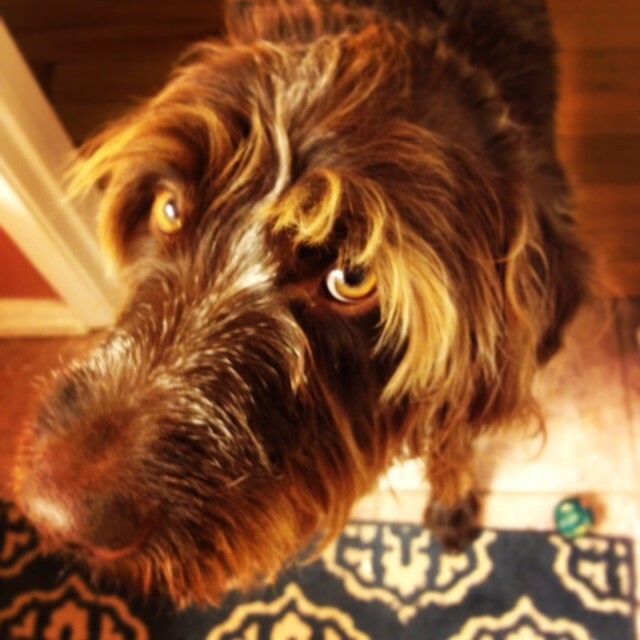 It is supposed to get into the mid-90s today, so it is a perfect day to get dog baths and grooming out of the way. Mae will be heading up to her retirement home with my mom and brother in Valentine, Nebraska this weekend, so I want to get her all spiffy. 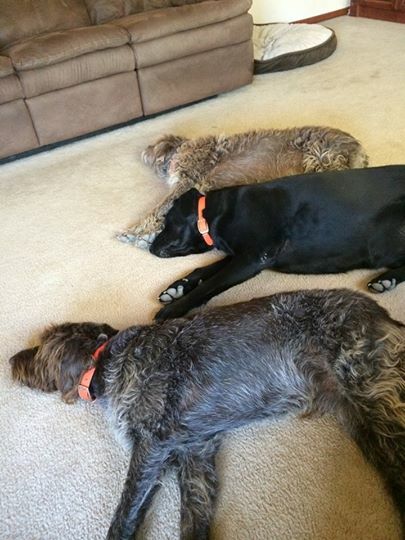 Speaking of retired dogs, I’ve gotten some pics and video of 10 year old Sue who is retired up in South Dakota and she looks to be enjoying a relaxing family life up there. 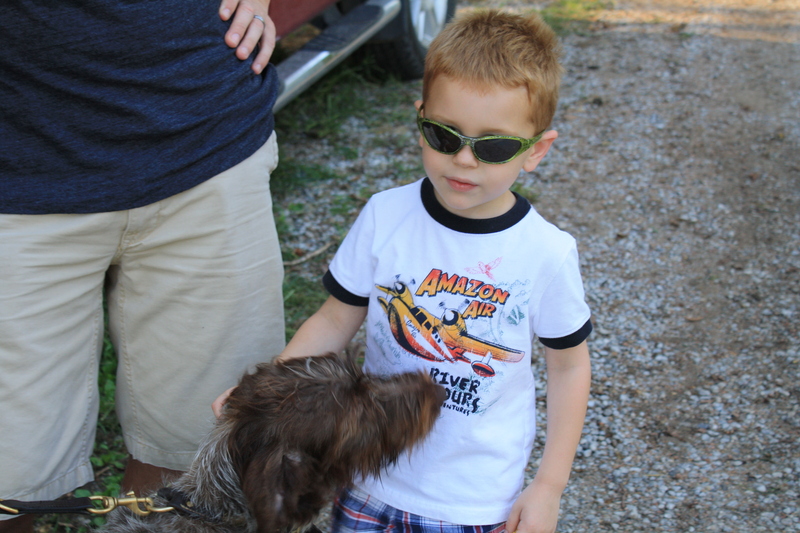 I am so thankful to the folks who are choosing to take our retired dogs, as an acre and a small house that is already full of kids just isn’t enough to keep an active breeding and hunting program going without transitioning the elders. 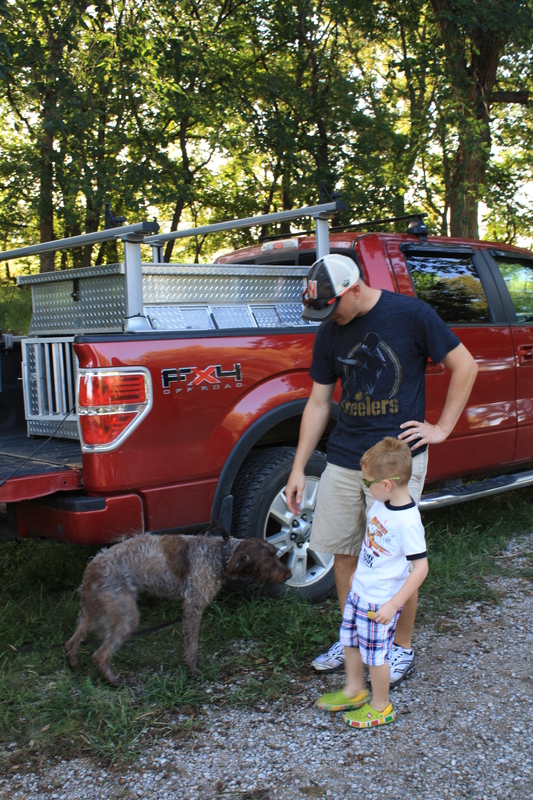 Right now we are mainly working on getting Fire ready to hunt with us this fall. 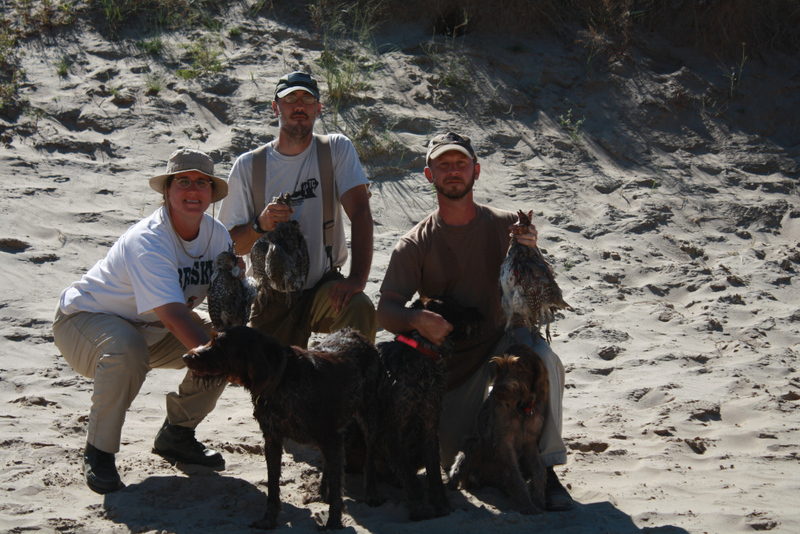 Opening day of sharptailed grouse season is only 2 1/2 months away! 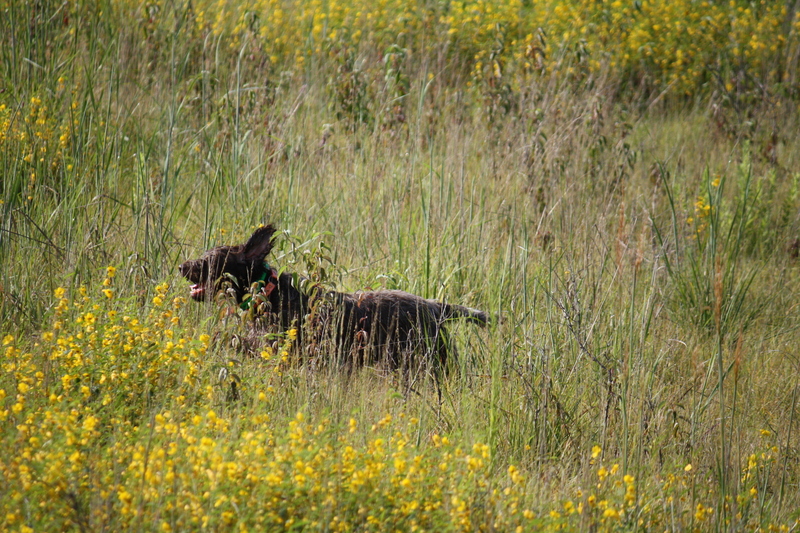 She comes when called, searches out in front, retrieves, has a good point, and isn’t afraid of the starter pistol sound. 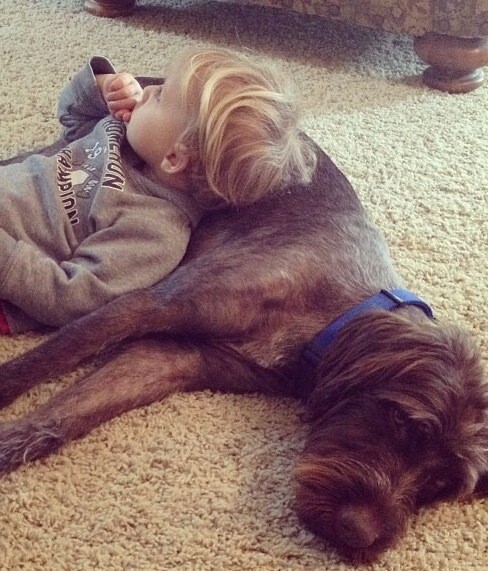 The housebreaking accidents are getting to be more infrequent. I seriously think that griffons are one of the slowest breeds to housebreak and am finding that it usually happens between 16-20 weeks. 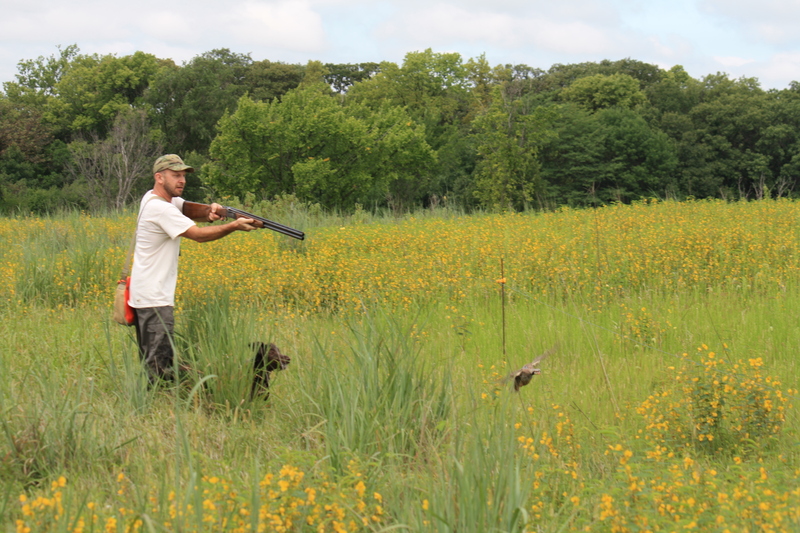 I went out with Charles on Saturday when he worked with Fire on some planted quail. Obviously this video is edited for time as we walked for probably 30 minutes or more. 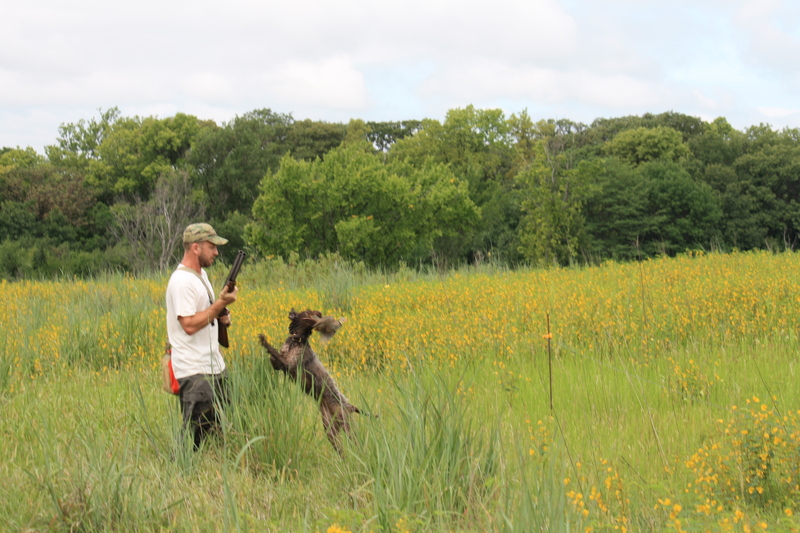 I apologize that it is impossible to see the dog point because of the thick cover, but you know when the dog is pointing when Charles gets his starter pistol ready to go. Keep in mind that the pup was first started on pointing/flushing birds without a gun, then with a kids cap gun, now a .22 starter pistol with acorn crimps. We are getting close to working with a shotgun. Ernie up in North Dakota sent me a video about a week and a half ago of Duncan, who was 10 weeks at the time, pointing a pigeon. I love the timing on this since I had a gentleman ask me a week or so ago if I guarantee my dogs pointing abilities. I don’t guarantee it in writing because I can’t guarantee someone training a dog incorrectly and messing it up, but the natural ability and instinct is all there and I see it starting at 5-6 weeks old here in the yard. I think that the only way that a griffon wouldn’t naturally have pointing instinct would be through poor breeding practices, but I’ve heard of plenty of housepet and show dog griffs who have the instinct without formal training. They are pointing dogs, they all are supposed to point naturally. I’ve never had anyone tell me that one of my puppies doesn’t point. Thanks again to Ernie for sending that video over! 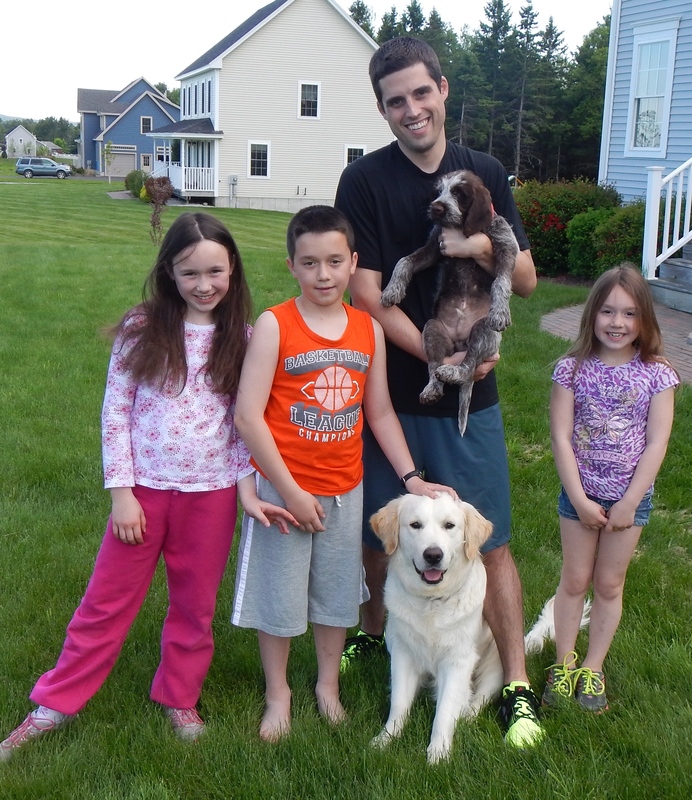 I received a picture of Hez in his new home in Bangor, Maine with Tyson and family. 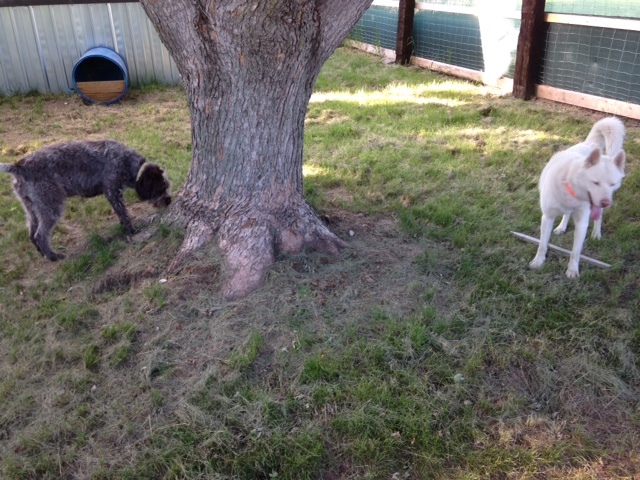 He also has a big golden retriever friend named Ferg and they are all getting along splendidly! Someone asked me recently about how I ship puppies by air cargo. Well, I get an interstate health certificate from the veterinarian (needs to be dated within 10 days of travel). Then I buy the intermediate level crate, which is 22 inches tall, 28 inches long, and 22 inches wide. I take all of the plastic hardware off of the outside of the crate and replace with metal nuts and bolts, then fill the crate about 1/3 full of shredded newspaper. Each side of the crate has “Live Animal” signs taped on to it, with a leash, a small bag of dog food, and the shipping/care instructions taped to the top. I attach food and water dishes to the inside of the crate, then simply place the pup in the crate with his collar on. I always have the pup take the first available flight out of Omaha Eppley so they are more mellow. I am about a 15 minute drive from the airport, so I feed and water the pup, give it a walk to go potty, and away we go. I use Delta Pet First/Air Cargo. I check the dog in at the air cargo office (which is over with the FedEx and UPS buildings), they pull the pup out of the crate and inspect the crate for any contraband, put the pup back in and ny-tie the door closed. All of the holding areas in both the airports and the planes are climate controlled so that the pup never experiences extreme temperatures. I wish I could put a little camera in the crate and see what the pup sees when he is being shipped, it must be exciting. But I think that the cargo folks are really nice to the pups because they’ve never come out of their crates traumatized. I’ve shipped 15-20 puppies this way and have never had a problem at all. Some breeders do not ship air cargo from reading a story or two on the internet, but it is like anything you read from questionable sources. 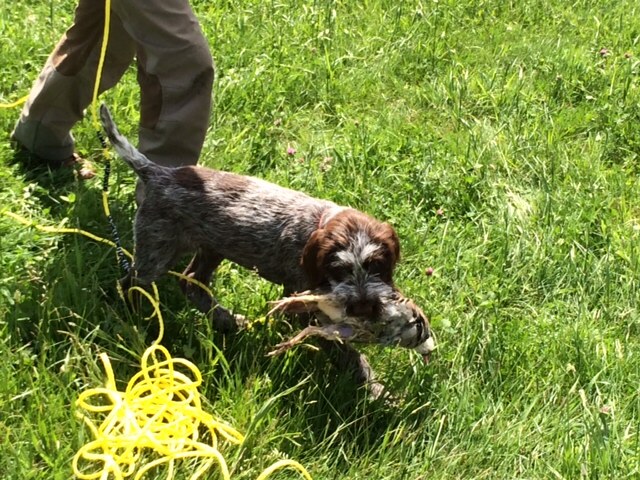 Fire is coming along nicely at 15 weeks old; Charles has been planting birds for her once a week to point and flush. He has switched from using the kiddie cap gun to the .22 starter pistol with blanks and she couldn’t care less about the noise. He’s talking about incorporating the remote bird launchers as to avoid any accidental “traps” (when the live bird gets caught by the dog). Then once he feels comfortable there, probably mid-July, will try the first live-fire exercise with a shotgun. I will try to get out to catch some video of this process. 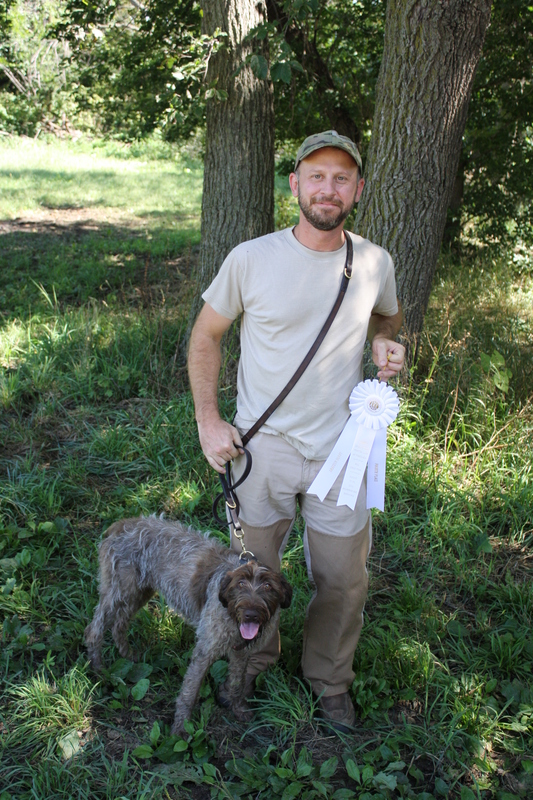 Congratulations to owner/handler Lou Volpe and Bluestem’s Big Sky Rendezvous “Midge” on a NAVHDA Natural Ability Prize I with a perfect score of 112 at the Montana Sharptail Chapter test over the weekend! 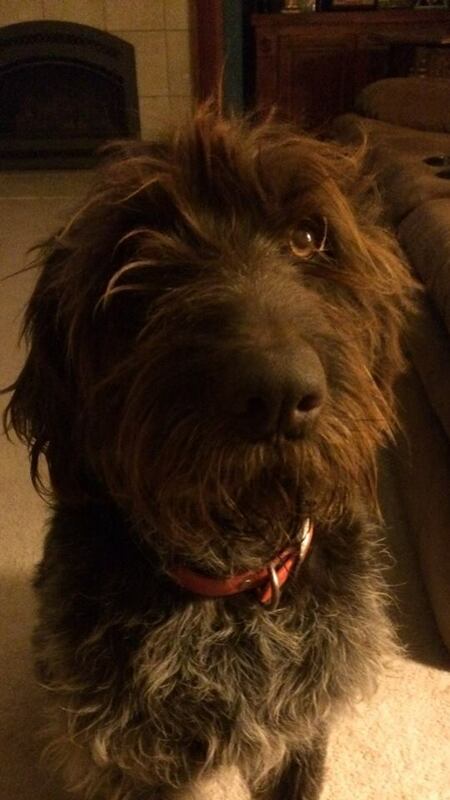 Midge is from our 2013 “F” Litter from Sam and Mae. Great job everyone!!! Back at the end of April, my very first litter from Sam and Sue turned 4 years old. Here are some recent owner photos from the litter that changed my life for good! 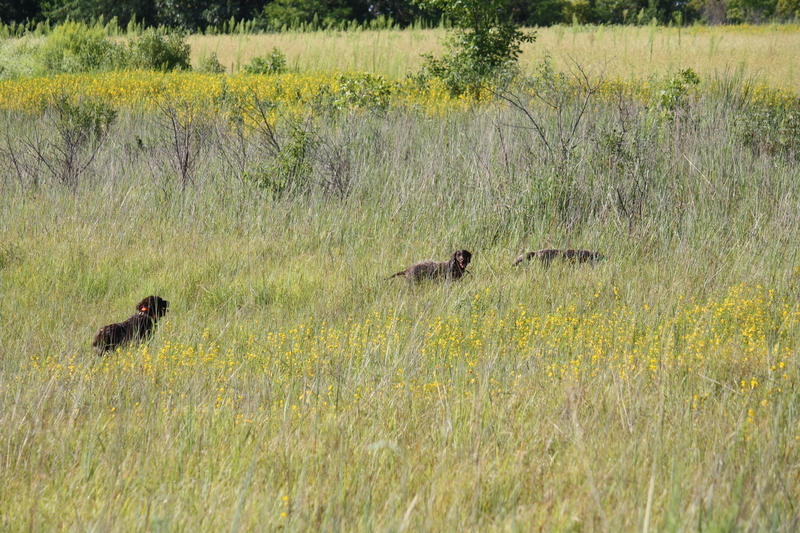 I also saw a cool video on Whiskey’s mom’s Facebook page of him hunting chukars with his girl, Andi. 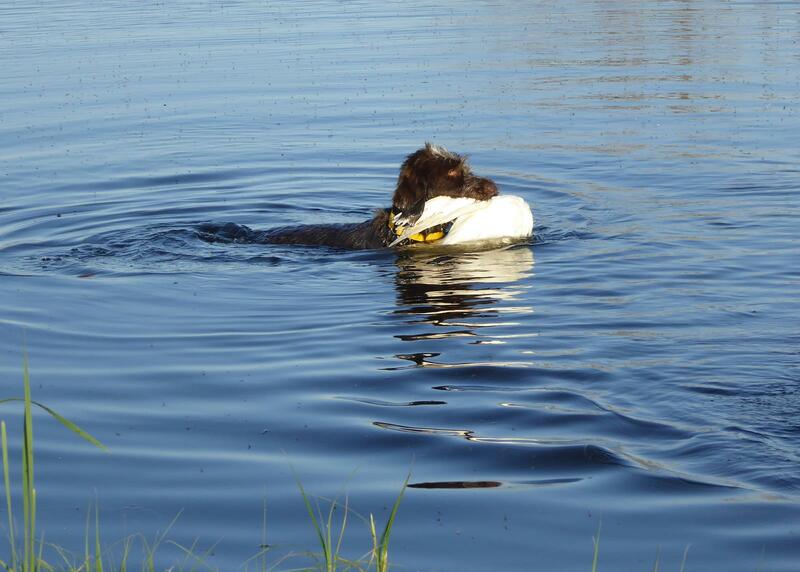 Susan and Tom have been working with TracHer on preparing for her NAVHDA Utility Test and sent me some pictures of her retrieving a giant Muscovy duck. The first picture is of her retrieving it after a 60 yard dryland track from a drag and the second is a water retrieve. 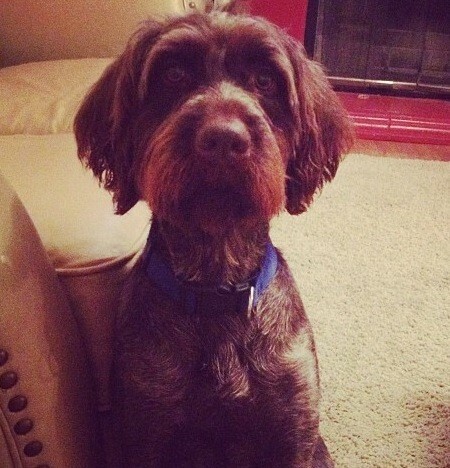 TracHer is from our 2012 “C” Litter of Sam and Mae. I have one last bit of media to share with you and that is a YouTube that I made from a couple of video clips that new owners of this year’s litters sent to me. You can see the pups style and personality already starting to shine through! Many thanks to all of my generous owners who take the time to update me with photos and videos so that I have something to share with you! It is greatly appreciated and keep it coming! Hope that everyone is enjoying the beginning of summer and I’ll check back in soon. 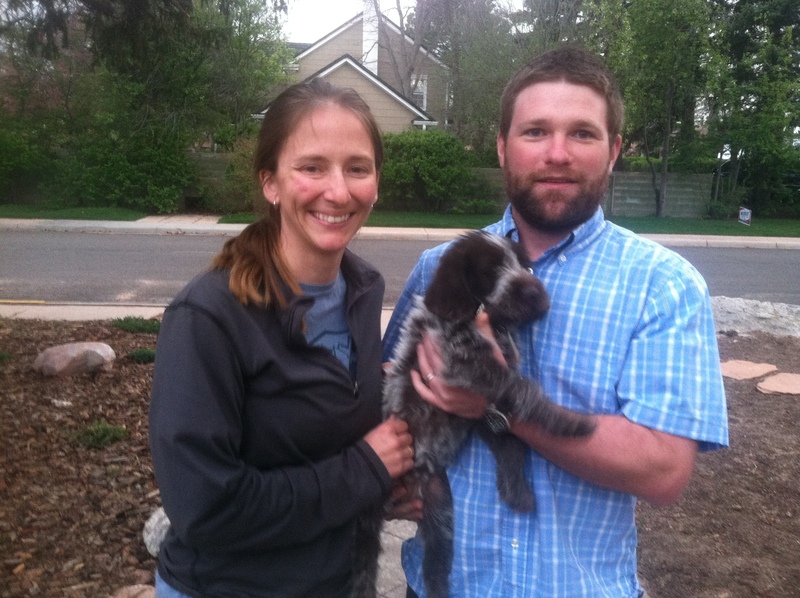 I am officially puppy-free for the rest of the summer (aside from Fire, of course)! Everyone went home on their 8-week birthday on Tuesday, except one who went home on Sunday. Herbert went across town with Bill and family. Harriet’s went to South Dakota with Matt and family. Harold went to North Dakota with Ernie and family. Hez is not pictured because he took a plane all the way to Maine! He arrived safely without even messing in his crate. Maybe one of these days Tyson will have a chance to send us a photo. Mae did well with her spay and is ready for retirement. 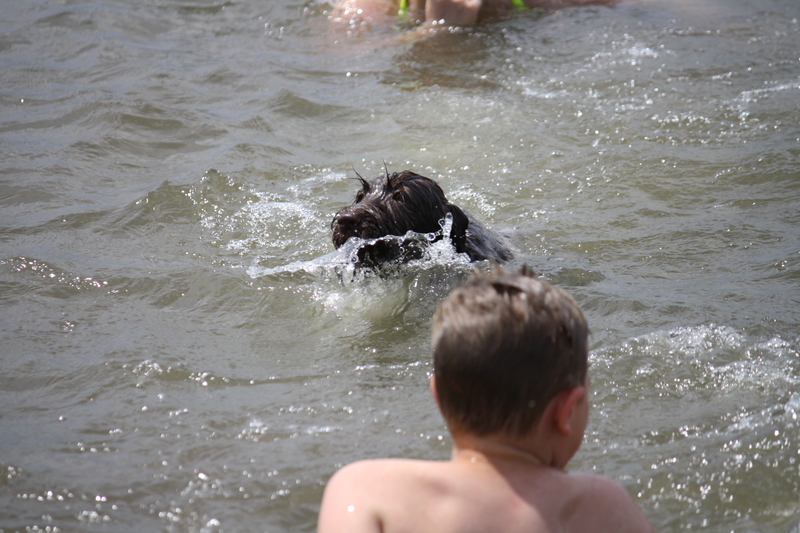 We took Sam, BB, and Fire out on Memorial Day for Fire’s first swim. Fire swimming with the kids. Sam found himself a big stick. BB and Fire having a run on the shore. I hope that everyone enjoyed their extra day off! Spring NAVHDA tests are upon us, so I’ll be looking forward to any pupdates on that front and any others! Fire is due for her last round of shots this week, so then we’ll be ready to start going to training days. I also need to think about getting her trained up to go into the show ring at least once. Maybe we can learn to enjoy it because BB, Mae and I really did not. But if at first you don’t succeed, try again, right?